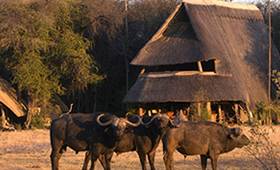 Hwange offers a full range of safari lodge options, across a range of budgets. Inside the park luxury safari lodges operate from remote bush locations, offering clients a wilderness experience to remember. Outside the park lie further lodges and hotels, some on private estates adjoining the park, and all of which offer game drives exploring their local patches. 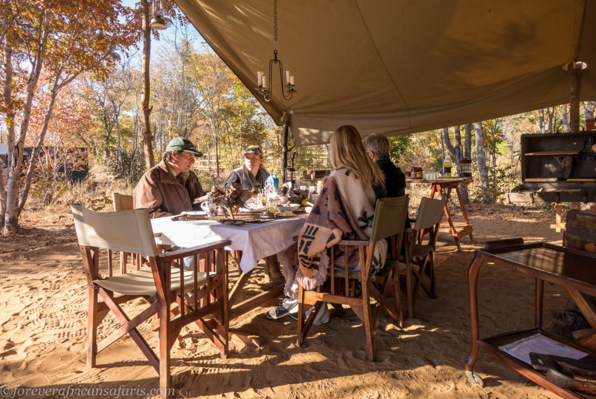 Located on its own private concession just outside the Park close to Main Camp, this small private safari lodge is full of charm and character. Situated within the woodland fringe and overlooking it's own vlei-line waterhole which often attracts varied game. Owner/managers Brian and Marleen are known for their welcoming nature and personal service. The lodge offers its own guided game drives into the Park. 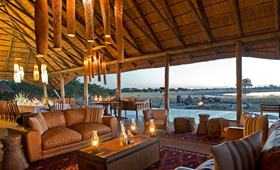 Situated on its own private concession adjoining the Park, The Hide is close to some of the best safari viewing areas in this section of the Park and has rightly earned its reputation as one of the Park's most popular safari lodges. 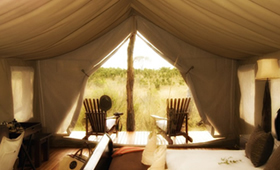 Comfortable furnished tents with en-suite bathrooms and private viewing decks overlook a private waterhole. Guided game drives (including night drives) and bush walks available. 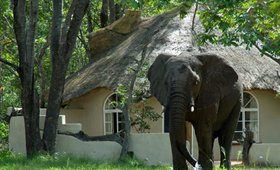 Located on its own private concession within the Park, Camp Hwange has quickly established itself with a reputation as one of the best in Hwange. Guided game drives and bush walks available. Shaded by acacia trees, Somalisa is an elegant bush camp with six luxury furnished canvas tents, king-sized beds and en-suite shower and toilet. The camp is solar powered, in keeping with the camp's ethos on minimising the environmental footprint of its operations. There is a pool overlooking a waterhole, and elephant often drink from both. Guided game drives and walking safaris. The Camp offers four vintage style safari tents with either twin or double bed arrangement. Each tent has its own en-suite shower with loo, bush shower (hot and cold) and hand basin – all in traditional safari style.